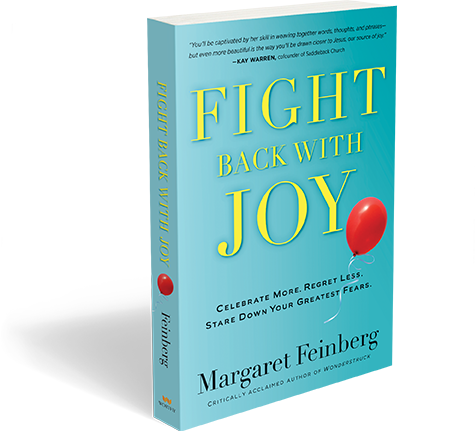 Margaret Feinberg’s new book, Fight Back with Joy is out and and it is another fantastic challenge brought to you in only the way Margaret can deliver. Over the years there have been many authors who have challenged me into a deeper walk. But none have connected with me in such a real and personal way as she has in her latest book. She has shown a great determination to fight for joy in the midst of her battle with breast cancer that is inspiring! I believe you need to read this book. I know you will not be let down. You will be encouraged and you will have a spark set off in your heart with a search for joy that can only be found and lived out in Jesus. 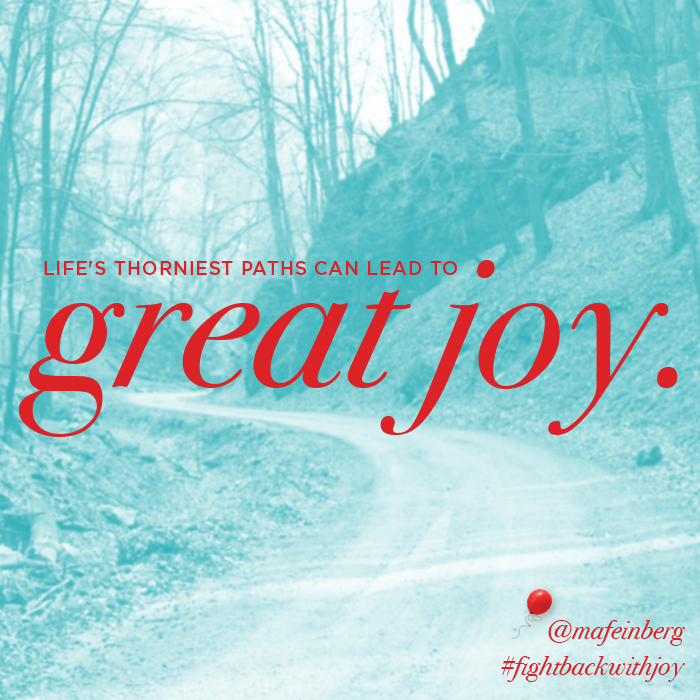 Take a moment to walk with Margaret as she takes you on her journey to #fightbackwithjoy. It’s been inspiring to learn how Margaret has been practicing a defiant joy, and I thought you might like to get an insider’s look, a sneak peek of the video and read an interview with Margaret. Preview the 6-Session DVD Bible Study, here. fight with a life-threatening illness. What was your difficult diagnosis, and what has your journey to health entailed? disease it represents thousands of different diseases with their varying components and factors. Being diagnosed under the age of 40 is significant. I’ve been through a brutal year of chemotherapy, radiation, and more surgeries than I can count or want to remember. Why did you write Fight Back With Joy? I studied joy for a year and was putting the finishing touches on my book on joy—just two weeks from turning it into the publisher, when I received the diagnosis. I had been pursuing and activating joy in my life in the relatively good times, now I had to do it in the midst of darkness, depression, and torturous pain. Through the process, I’ve discovered the breadth, depth, and power of joy—that despite hundreds of sermons and many decades in the church—no one had told me of before. In Fight Back With Joy book and Bible study, you really push the reader to reevaluate their definition of joy. Why do you think this is so important? Much of the teaching I’ve heard on joy over the years is oversimplified. I remember those days in Sunday school learning that JOY is spelled Jesus, Others, Yourself. While that made perfect sense at 9 years old, I’ve seen how distorted that can become as an adult. I see friends who love Jesus but spend so much time pouring into their kids, grandkids and others that their joy looks something like this: jOy. Technically, it still spells joy, but more than anything, these men and women who are so exhausted, so empty, so running on fumes from pouring into others need to pause and take time to focus on themselves. Laying hold of joy right now will require them to reevaluate for a season and discover the joy that comes with JYo. I also noticed how most of the definitions of joy define it more by what it isn’t than by what it is. I constantly heard that happiness is based on circumstance but joy is not dependent on circumstance. Biblical expressions of joy turn out to be far different than what I had been taught. I am now convinced the writers of the Bible would say that, the reason we have joy is because we have great circumstances. If you are a child of God, you are drenched in the grace and mercy of God. No matter what you’re facing: Your circumstances are better than you think. If you’re not experiencing joy, perhaps it’s because your definition of joy is too narrow. On a scale of 1-10, how hard was it for you to write this book and Bible study? An eleven! This journey has been the most painful experience of my life. And, to share about it requires some vulnerability. Okay, a lot of vulnerability. And, that’s really, really hard. But I feel like I’m finally ready to share what God has stirred in my heart along the way because although cancer has been the most painful journey—it has also been the most joyful. And no one is more surprised than I am. Pick up a copy of Fight Back With Joy at Amazon or Barnes and Noble today. Are you familiar with the ending to the movie “Cast Away”? Tom Hanks is standing there in the middle of this intersection in the middle of Nowhere, TX. As far as he can see in all directions is nothing – yet he has been given the gift of life to be lived another day. If you had been him, how would you have chosen where to go? We all find ourselves at places in life where we are at an intersection and we aren’t sure which way to go. In the movie, he isn’t sure where he is going to go. He pauses and gets out of the Jeep with his map and ponders for a moment or two. During this moment of contemplation is when the person he was looking for drives up. I wonder how many times in life we come to a crossroad and ignore it and just keep driving our lives right on through. Or – how often do we get there – and recognize it… and then we get stuck there afraid to move at all. Maybe there has been a bad decision in the past and fearful of getting burned again. No matter the reason or how you would respond to the situation it is still a decision that must be faced and made. No decision is still a decision. How do you make the decision? What steps do you take? Do you get the Road Map out? In my life, the Road Map has become God’s Word found in the Bible. No, it doesn’t tell me to turn right or left and any specifics like that at all. I can say the Holy Spirit gives insight I can’t explain. Which is often followed by a peace I can’t explain. I’m telling you these things while I’m still living with you. The Friend, the Holy Spirit whom the Father will send at my request, will make everything plain to you. He will remind you of all the things I have told you. I’m leaving you well and whole. That’s my parting gift to you. Peace. I don’t leave you the way you’re used to being left—feeling abandoned, bereft. So don’t be upset. Don’t be distraught. (The Message). I’ve personally been at a crossroad for a long time now. I have ventured in a couple of directions already to find that the peace, fulfillment, and contentment were not in the directions I have tried thus far. I am still hungry to know God more so I keep going back to the Cross and asking for direction. I am asking for wisdom… wisdom to be used for His glory, for the leadership of my family, and the community in which I live (wherever that would take me). “This is what I want you to do: Ask the Father for whatever is in keeping with the things I’ve revealed to you. Ask in my name, according to my will, and he’ll most certainly give it to you. Your joy will be a river overflowing its banks! (John 16:23-24). I know He uses me through my job… even though I can’t directly communicate His Word… I live it. I’m thankful for the opportunity I have to influence others in all aspects of my life. I want to continue to do so full of the Holy Spirit, wisdom, and grace. When you step back to take a look at your life, what do you see? How do you evaluate your place or position? What tool do you use to measure in order to see if you are where you need to be or want to be in life? There are many voices and tools “out there” to give us the help and guidance in life to get us from where are to where we really want to be… or more importantly, to where God wants us to be. For me, the greatest tool is reading the Bible. I find direction, strength, hope, and encouragement in the words I read there. Reading the Bible is a discipline that I must not neglect and must be a part of daily living. I was recently challenged to think about what my ideal life looks like. As I began to think about my response, I thought back to the 4th grade. I was sitting in a room in my house and I recall thinking, “I’m not going to be like that.” I can recall the voice of my dad saying he wish he had made other choices about his career. I can recall the career path he would have preferred over the one he was on at the time. In my pursuit of God and living in obedience, I struggle with keeping of my stride since it has been broken. I’m involved in quite a few really “good” things. I visited one of those recently. I walked out of that meeting and overwhelmed at the need in our community and the task that is set before them. The thought kept rising in my mind that they are Jesus in their corner of our county. They are literally being his hands and his feet. Reaching out to those who can’t feed themselves. 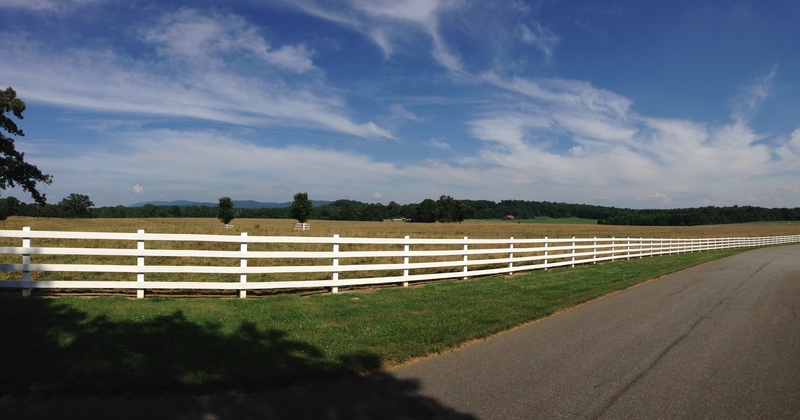 I was unsure about what my experience would be as I drove onto the property. I drove away challenged. I once was a competitive long distance runner. I recall the feeling of having someone break my stride because they cut me off. It was a breaking of my stride physically and mentally. I could get my physical stride back pretty easily but, at times, it was the mental portion of it I would have difficulty over coming. I can recall dwelling on what had just happened and that becoming my focus over the race being run. You are never a failure until you quit. Resist discouragement and finish the race God has set before you. -Rick Warren, Uncommon Courage Devotional. I mentioned earlier there are a lot of tools to help us on our journey in life. God’s Word is the greatest of those… His word is truth. 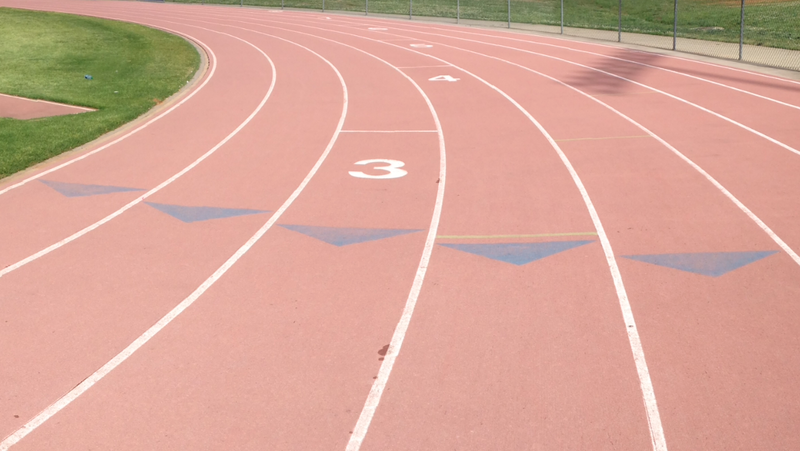 At times, each of us have moments when someone or something breaks into our lane and breaks our stride. Keeping our eyes intently focused in the Word of God will help us to keep our focus. The Holy Spirit will use those words to lead us where God wants us. If you are in a place in life where someone has cut you off and broken your stride, now is the time to bring life back into focus. Looking toward the goal that has been set within your heart. “You were running a good race. Who cut in on you to keep you from obeying the truth?” (Galatians 5:7, NIV). Don’t let the distractions of this world, the words of others, or the actions of others break your stride. Keep running. I recently read an article posted on Facebook. I was shocked at what I read concerning a “leader in the church.” I thought that can’t be true. Yet before I investigated the truth of what I read – I sent the link to a couple of my friends. Later in the evening, I was discussing this article with someone else. Based on that discussion, I decided to actually do some research on it. I discovered that the original article was an “internet hoax.” I came to this understanding as I sought out multiple resources. Even with a closer examination of the original article, it even stated on the website that what was posted was “satirical”. (I over-looked that). That’s why it is important for us to make informed decisions about our lives and the faith we so often proudly proclaim. Or the faith we so proudly try to disclaim. Not only are our lives weighing in the balance but the lives of those we come in contact with on a daily basis. I had never heard of the source of the original article. So when I first read it I was skeptical. Yet there were some interesting quotes that made me think, “Well, I guess that could be true.” By the time I finished reading the article I was ready to send it on to a couple of friends with the subject, “Wow!” And that is exactly what I did. As a result of this experience I asked myself, “Why do I believe what I believe?” I want to pose the same question to you, “Why do you believe what you believe?” Why do you believe in God, Jesus, Holy Spirit? Why do you not believe? Why do you believe in some other god or religion? Why believe there is no such being greater than our current existence? I’m wanting you to consider this in order to draw you into a deeper relationship with God or to bring you into a real search for truth. Did each of us come to our place of belief because we personally sought truth? Or did we stumble into our belief (or disbelief) in God based on our parents, family, friend(s), or culture? I write here with the presupposition that those who read are already Christians. I do so not to negate or over-look those who are not Christians or those seeking the meaning for life. So, please know If you aren’t a Christian, I think of you as well when I write and pray you come to a place where you are brought to God through the power of the Holy Spirit at work in your life because you have sought to know Truth. If you are a Christian, I hope you will take the time to reignite your faith but answering the question about why you believe. I hope that asking yourself will lead you into a deeper relationship and a greater walk of faith in obedience to the love of Jesus for his people. If you are not a Christian and are still searching, I hope you will not give up in your search for truth. Jesus said, “Seek first the Kingdom of God and his righteousness…” Matthew 6:33. If all of us will live seeking His kingdom before anything else – we will not be disappointed! Walking with God is not always as clear as we would like for it to be. But then, maybe we shouldn’t desire for it to be clear. Walking with God is about trusting Him… trusting his Son, Jesus, to be who he has destined to be in our lives. And allowing the Holy Spirit to have total freedom to lead and empower as He desires. 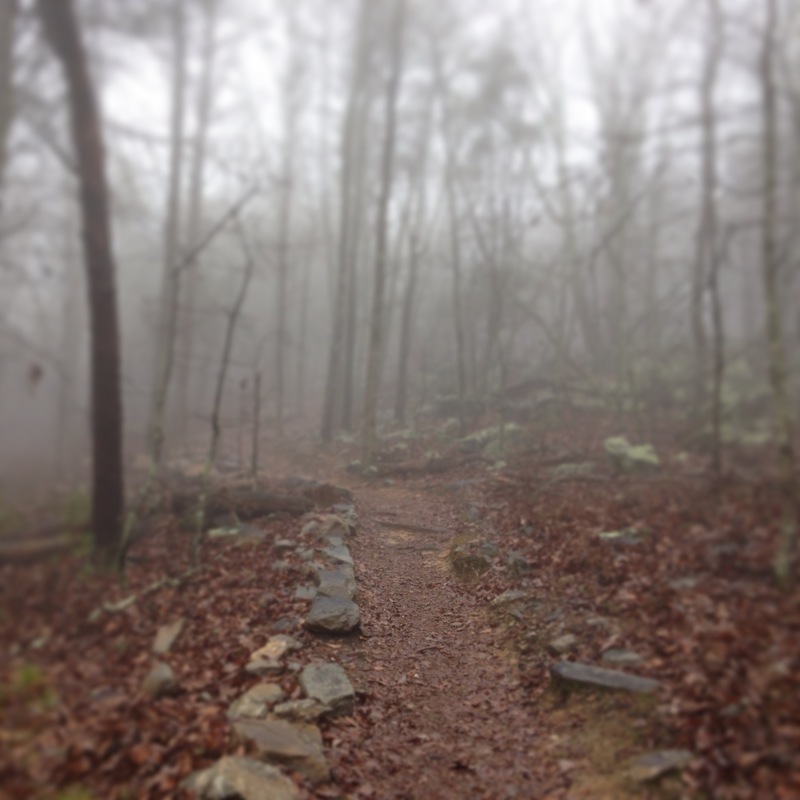 Today, I went for a hike on a rainy day up Pine Mountain. As I walked up the mountain, I thought of Moses and wondered what it was like for him to walk up to spend time with God in such an intimate way. I’m no Moses but as I approached the clouds I asked God to surround me and let me walk with Him up there. I didn’t descend the mountain with stone tablets or a specific word to share with His people, but rather an assurance He is with me. GOD said to Moses, “Get ready. I’m about to come to you in a thick cloud so that the people can listen in and trust you completely when I speak to you.” (Exodus 19:9, The Message). Walking into the future is much like this path. I’m asking God to fall on me and my path as the clouds did today on the mountain. Totally enveloped by His presence.